Learn more about how plants knit the salt marsh together, and what we can do when invasive plants threaten to take over. Nancy Olmstead, Invasive Plant Biologist with the Maine Department of Agriculture, Conservation and Forestry, will explain why plants are critical parts of what makes a salt marsh special. In 2019 FOSM will work with partners to develop a strategy and secure funding for implementing the report recommendations. 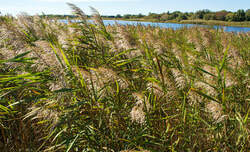 Learn more about fighting Phragmites, and what the results of months of testing have proben to us by clicking the file below! A HUGE thank you to Normandeau Associates, Inc for helping FOSM with the testing, and pulling of this report. Join Maine Audubon’s Staff Naturalist, Doug Hitchcox, for a discussion on the birds of the Scarborough Marsh, the threats they face, and ways that you can help protect them. Marine Scientist, Jon Lewis, will provide an overview of the rapidly expanding marine resource industry in Maine and an update on shellfish husbandry in Scarborough Marsh. Verizon is again on the agenda with their cell tower proposal. 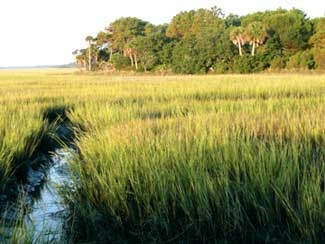 We want as many of us as possible , who are concerned about the marsh, to attend the meeting. From all of us here at Friends of Scarborough Marsh, we would like to extend a huge thank you to the over 40 volunteers that came out to help clean up the Marsh on Saturday! It was a beautiful day, and we all were amazed at the trash that was found. From car bumpers, to TV's, we wouldn't have been able to get it done without you! Keep your calendars marked for the next one on April 27th, 2019! The Friends of Scarborough Marsh (FOSM) is pleased to launch its 2018 – 2019 Scarborough Marsh Lecture Series. In its second year, the monthly series has been crafted to deliver a range of interesting lectures on topics that pertain to the Scarborough Marsh and its environs—ecology, geology, function (e.g., in art, ecology, economy, natural resource infrastructure, recreation), history, vulnerability. This season’s lectures cover subjects ranging from plants, insects, birds, shellfish and other marsh creatures to human history. You will come away from each lecture with greater appreciation for Maine’s largest salt marsh and its vital place in our society and ecosystem. New England cottontail are a state-endangered species numbering fewer than 300 individuals in Maine. Join a regional wildlife biologist to learn how the Maine Department of Inland Fisheries & Wildlife is managing this species from the brink of extinction in the region with habitat management and a translocation effort to increase the population of this once-ubiquitous species. Bring the family for a friendly romp through Maine’s last Ice Age and the important discoveries that help us unravel this history. Learn how aquatic scientists in Maine, New Hampshire and Oregon are using advancements in DNA technology (eDNA) to identify organisms living in estuarine ecosystems by the matter they leave behind. eDNA avoids the capture of live animals or plants and the logistical challenges associated with traditional monitoring approaches. Friends of Scarborough Marsh offered raffle entrants the chance to win a pair of Gift Certificates for one hour kayak or canoe rides on the marsh. We thank the participants from Summerfest, Farmer’s Market and Summer Concerts. We encourage everyone to spend time enjoying the beauty of the Scarborough Marsh and congratulate the winners who will have a free hour to view the scenery on the waterways - Maureen Jordan, Judith Roy, Halina Loft, and Anna-Joy Bannon.